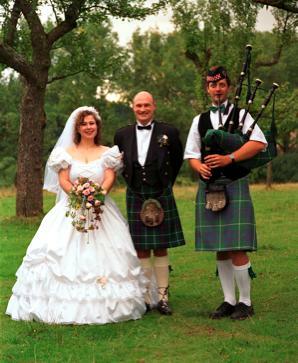 Why do you suppose so many couples want wedding pipers to be a part of their big day? One reason is that it is considered lucky to have a piper play, as you walk down the aisle. When my wife and I decided to have a Scottish/Bavarian theme for our wedding, it was obvious to us that we wanted a piper to play for us, both in the church, and then later at the reception. But where to find wedding pipers in Germany? It turned out not to be as difficult as you might think. The best form of advertising is word of mouth. And that's how we were fortunate enough to find Mike, who lived in a village not more than thirty kilometers from us. When we phoned to ask if he would be willing to play at our wedding, he said he would be delighted. We arranged a time to visit him at his home, where he asked if he should give us a demonstration of his piping skills. We immediately agreed, and I can remember it was quite a shock for Heike, as we were sitting in his kitchen, which was fairly small. When he started to play she was very surprised at how loud the bagpipes were in a small room, at close quarters. However Mike and I were able to reassure her that they sound wonderful in a church. And I can still remember almost fifteen years later, how beautiful "Amazing Grace" sounds being played in the church on a set of bagpipes. Below you can see a photo of us, with Mike the piper. It was also a day to remember for the local villagers, many of whom came to witness our wedding. And I'd be willing to bet most of them had never experienced such a wedding in their local church, either before or since, and the skirl of the pipes echoing in the rafters will I'm sure remain with them always. So are pipers at weddings popular? Yes, and becoming ever more so. I know that Heike and I would not have enjoyed our wedding nearly so much, if the piper had not been there. If you are having problems finding a piper for your wedding, then drop me a line using the "Contact Us" page and I will do my best to help you find one.